Picturesque Marsaxlokk in the evening light. 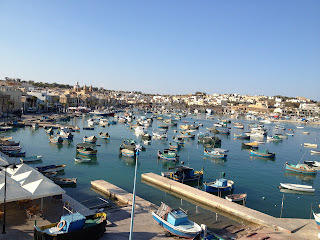 One of my favourite places on the island of Malta is the fishing village Marsaxlokk. Just 4000 people live in this picturesque bay, where numerous "Luzzi" and their smaller and bigger fishing boat variations with the mythical eye painted on their prows shine their bright colours in the sun. The Luzzu goes as far back as the Phoenician era, and it is a popular model for many postcards and holiday photos. Most of these robust boats are still being used to catch the fish - also to be enjoyed in the restaurants that line up at the quay. And not only there. 70% of Malta's fishing fleet is based in Marsaxlokk, and with a bit of luck and at the right time of the day, you can see the boats unloading a variety of fish and sea food. 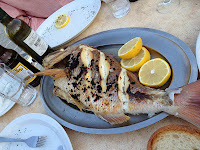 Pink sea bream straight from the grill. Malta's Southern hop-on/hop-off bus tour stops in Marsaxlokk, which makes it easy to visit the village during a day's excursion. The visitor can find stalls selling souvenirs, t-shirts, hats and the likes, while on Sundays this market morphs into a huge, fully fletched market and stretches along the entire quay, as popular among Maltese as it is among tourists. 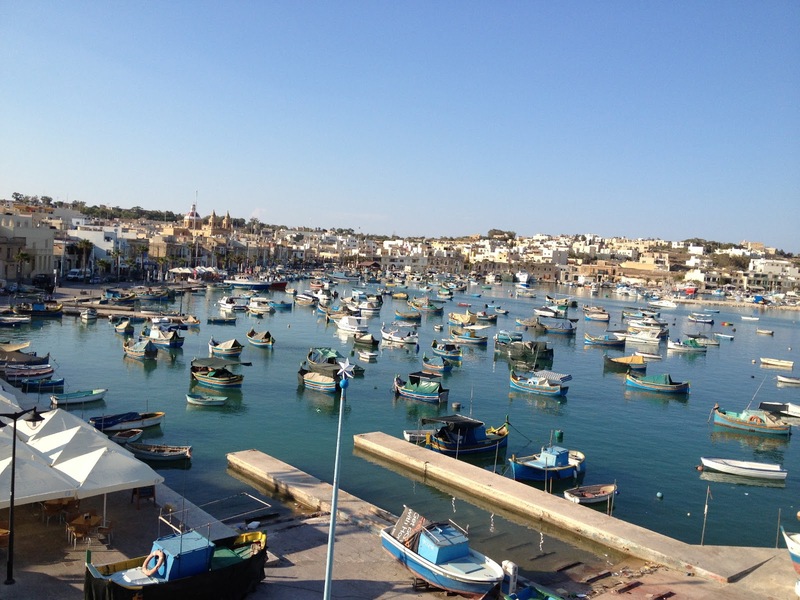 Marsaxlokk is not (yet) a major vacation destination, and accommodation is very limited. When you walk the quay at night, you will notice that the village belongs to the Maltese again, as they sit outside their houses and at the quay to chat along into the night.